I found this beautiful beetle in my kitchen. I covered it with a glass, studied it and then looked it up. It looks like an American Burying Beetle, Nicrophorus americanus, an endangered species that years ago lived in 35 states in the USA. Today there are only two places on earth where it is found: Oklahoma and Block Island, a tiny island off Rhode Island. Rhode Island is the smallest state in the USA. It is about the size of a US city. Guess where I live? I live on an island in Rhode Island, but not Block Island. 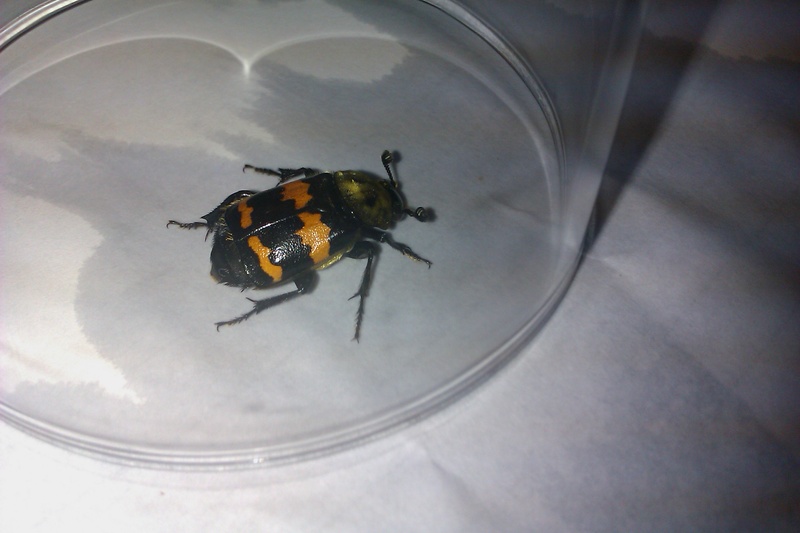 Nicrophorus vespilloides, not Nicrophorus americanus. I let the beetle go. This entry was posted in Life and tagged American Burying Beetle, americanus, beetle, Block Island, bugs, endangered, entomology, insects, nicrophorus, Oklahoma, vespilloides. Bookmark the permalink.